I'm not too sure on the difference between this topic and day 23's 'Something from your favourite store'. Maybe that's because I don't buy clothes online (I like to try them on and don't want to pay for returns) and I'm not into any particular designers. Therefore favourite brand of clothes and favourite store are the same. For that reason, I decided to take about my favourite make-up brand! If you split the products I own by brand and counted them up it would look like my favourite make-up company is either Aromaleigh or Sleek. But though I love them dearly, they have failings in one form or another. I don't like Aromaleigh's current and most recent ranges as much as I do the eyeshadows I bought from Aromaleigh V1, and they only make powder cosmetics. I love Sleek's eyeshadow palettes, though most of them have one or two shades that I won't use as they don't suit me, and their Pout Paints, but I don't really have much interest in their other products, either because the reviews are mixed (as for their new Eau La La pencils) or because the shade range isn't quite right. I've heard good things about their lipsticks but the available shades have yet to inspire me to pick one up. Urban Decay on the other hand - I have three eyeshadow palettes, and love their primer, but I want so much more. Liquid eyeliner in Retrograde (purple, obvs), lipsticks and lip glosses in a variety of shades of red and dark pink, and I certainly wouldn't mind giving their highlighters and blushers and face primers a try. The only thing I definitely don't want is their glitter eyeliner, because I've heard it's pants for the price. Oh, and the brow set, because I don't fill in my brows. Even the packaging is gorgeous - palettes with pop-ups, silver and purple in abundance. 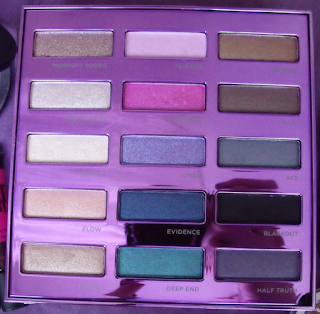 Pictured above is the 12th Anniversary Palette, my third Urban Decay purchase, that I got almost as soon as it came out last summer. When I've attempted to do swatches the results have been not altogether inspiring, so I'll suggest you visit Lipglossiping for them.